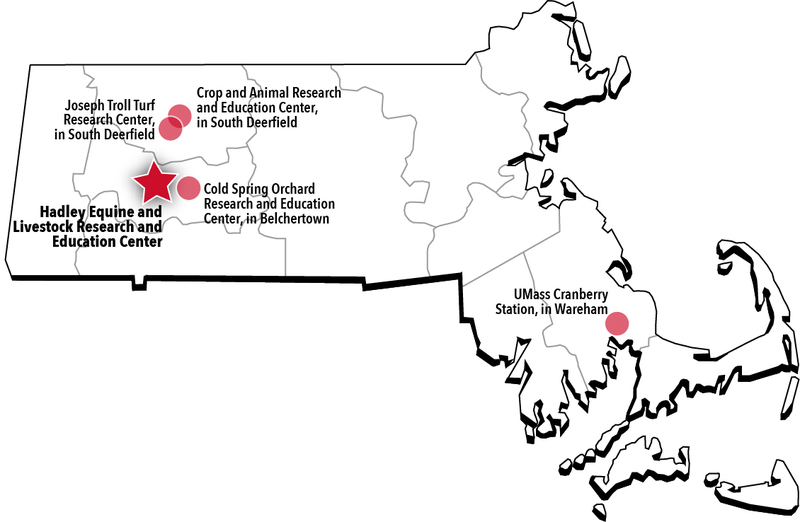 This is the first in a series about the five farm-based research and education centers operated by the Center for Agriculture, Food and the Environment at UMass Amherst. At the University of Massachusetts Amherst, agriculture runs deep. So deep, that 150 years after Mass Aggie opened its doors, right up until today, students can still get their hands in the soil and researchers can still find fertile fields for their experiments. As on any working farm, work on these UMass farms can be up-close and personal: visceral experiences that are felt, seen, tasted, smelled and heard. Today, more and more people want to “learn how to use the right end of a shovel” to grow food. Long-lasting effects of climate change, limited land access, development and population growth are some of the factors pushing people toward greater food self-sufficiency. At UMass there are many opportunities for education that can hedge your bets on a positive, hopeful outcome; students can incorporate practical skills into their lives in the fields of agriculture, food and the environment, if they choose. UMass Amherst has five research and learning facilities (farms) along with several smaller student-run gardens, both on and off campus. The goal of the larger farms, collectively, is to support research, teaching, and the mission of the College of Natural Sciences and the University. Practically speaking, the chance to set foot in an outdoor education is available on over 450 acres. Bob Schrader, Associate Director at the UMass Center for Agriculture, Food and the Environment and longtime UMass Extension veteran. Bob oversees operations of four of the farms. He has been employed at the university for 37 years, connecting people and information to real-world needs through his work. Gene Duda is a busy man. He is a jack of all trades and, apparently, a master of them as well. His easy manner belies the hard work he handles every day on this 131-acre farm. Gene is responsible for managing all aspects of maintenance. He operates farm equipment, builds paddocks, mows fields in summer and plows roads in winter. Every morning, he can be found grooming the impressive horse arena. He describes Hadley as a unique farm for this region offering students experience in caring for a large indoor arena, equine management, livestock handling, equipment operation and specific instruction in how to manage a farm. Duda is well-suited to the work of managing the farm. He grew up in Easthampton, Mass. as a fourth-generation farmer on a 400-cow dairy farm: he knows how to work equipment and juggle all the many tasks that have to get done. Need over a mile of electric fencing installed? Gene is your guy. He recently taught his students how to accomplish this task, interacting with them to learn skills for the “real “world. Since 1994, Gene has acted as superintendent of one, two or three of the farms around campus. 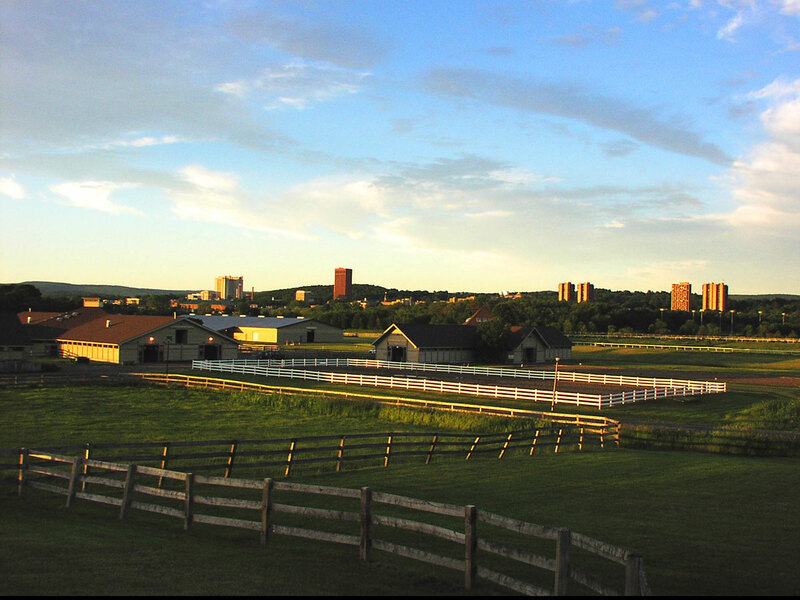 His pride in maintaining this beautiful parcel of land surfaces as he describes this farm as the introduction to UMass Amherst for many new students and their families when they drive by on the way to the main campus. It has to look great. Little details do not escape him. The welcome sign off Route 116 was blocked by trees, so he moved it to be more visible and, well, more welcoming. What does he like best about this job? “There is always something going on, always chances to interact with student to teach them something new,” he says as he marches off to work on a tractor. To free range or not to free range? This is the question that research assistant professor Hélène Cousin and her students aim to answer as a result of their poultry research over the next two years. Specifically, they are examining the effects that housing systems have on physiological stress and behavior of slow-growing broilers in New England. Their goal is to determine the optimal living conditions for poultry raised by the poultry management class at the UMass Hadley livestock barn. Students working with Dr. Cousin are Sasha Santiago and Daniela Orozco, both master’s students. While its fleece may be white as snow, researchers are looking at options for pain management for even happier lambs at school. Drs. Susan Marston and Katherine Beltaire, lecturers in veterinary and animal sciences, along with several students, are conducting a study to determine the effects of an anti-inflammatory drug on the physiologic and behavioral responses of neonatal lambs to standard management procedures: tail docking. Equine health research is being conducted by Carlos Gradil, extension professor in veterinary and animal sciences, and Cassie Uricchio, coordinator of the equine management program, along with outside collaborators on two separate projects of a proprietary nature. Masoud Hashemi, extension associate professor, and Cassie Uricchio are leading research about the environmental impact of equine operations and how to minimize non-point source pollution by these operations. If you like to work with farm animals or Baystate Morgan horses, you would feel right at home on this farm. The 131 acres at the Hadley Farm Equine and Livestock Research and Education Center house horses, sheep, swine, poultry and goats. The goal of this farm is to provide hands-on experience to undergraduates and graduates in animal sciences. Students and full-time workers share the work of running the farm. UMass Amherst offers one of the finest collegiate horse facilities in the country: two spacious horse barns with over 75 box stalls, reproductive lab and breeding areas, 100’ by 200’ indoor riding arena with state-of-the-art footing, a heated classroom, full-size dressage arena, and a 5/8-mile training track. 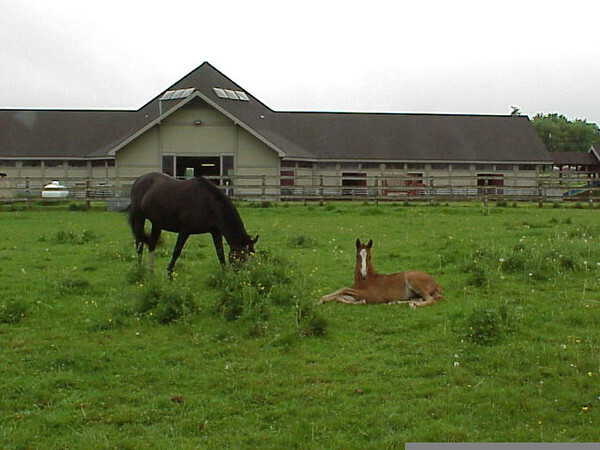 The Equine Reproduction Services facility, housed at the Hadley Farm, offers advanced assisted reproductive techniques to horse breeders throughout New England and offers students top-quality learning opportunities. Students are also involved in clinics and shows that are routinely held at the farm. What options exist for a student who wants to enhance their riding skills? Jillian Smith teaches the Hunter Seat Equitation and has been doing so for two years. The education she offers emphasizes a balanced seat and communication with the horse on the flat and over fences. If enrolled in lessons, students may also try out for one of many teams at Hadley Farm including IHSA Equestrian Team (hunter seat), IHSA Western Team, IDA Dressage Team, Morgan Show Team and a new Junior Equestrian Team. The women’s Polo Team rides at Stone Pony Farm in nearby Leverett, MA. Passionate. That is the word you’d use to describe Alice Newth’s approach to teaching students about best management practices for livestock at Hadley Farm. Her 31 years on the farm started at the former UMass dairy farm in South Deerfield. What she likes best about her job is working with students and she truly enjoys the fact that there is something going on all the time. Students receive excellent practical experience that works well for their futures in farming. Veterinary school admissions officers are pleased with UMass applicants that come with hands-on knowledge under their belts. Graduates are well-prepared to become employed in a variety of settings including zoos, veterinary clinics and farms. Poultry, sheep, goat and equine management classes are held at the Hadley Farm. Students can further their education about dairy management at a local farm.